Ladies and gentleman, it had to happen. The biggest blogging conference of the year happens to be in Chicago this summer. I’m going. Lots of my co-authors in I JUST WANT TO PEE ALONE are going. My in-laws live in Chicago, so I know and love Chicago. Lots of fans of the book and the co-authors live in Chicago. Lots of fans of the book and the co-authors will be in Chicago for the blogging conference. So why not have a BIG book signing at my in-laws’ restaurant the weekend that we’re all in town? Co-authors will sign books from 7:30-9:30 PM, readings will go from 9:30-10 PM. Readings will not be from the book, so you never know what to expect! 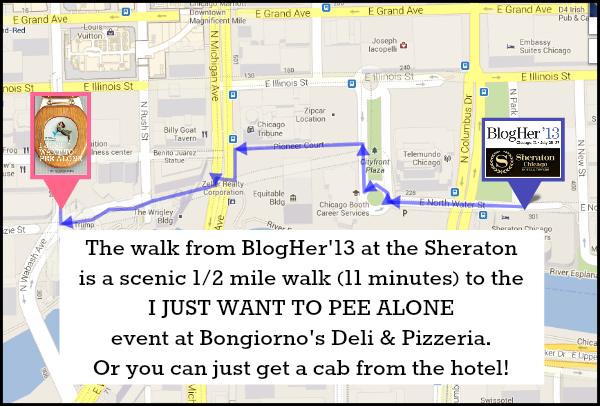 Walking distance from the BlogHer’13 hotels. Yes, this is owned by my in-laws! Yes, there will be deals on food for those who come to the reading, so arrive hungry! You can take something delicious To Go back to your hotel room, if you’re in town for BlogHer13 & have parties to attend after this event! See the full menu here. Deals for event ticket holders will be posted closer to the event. $15 and MUST be purchased in advance. It’s always cool to meet an author and have her/him personally sign your book. What is even more exciting is seeing one perform a piece she has written, live and while surrounded by fellow authors and fans who bring an energy to the room. Now multiply that by fifteen. This is going to be a night to remember! Make sure you’re following the official I JUST WANT TO PEE ALONE website and Facebook page for any additional information about this (and other) event. Look out Chicago, here we come! I have a feeling the recap of this one will be rather…innnnteresting.